Provide comfort for the family of Sandra Shumate with a meaningful gesture of sympathy. Ms. Sandra Marie Shumate, 57, of Greenville, South Carolina, departed this life on Sunday, April 7, 2019, in the comfort of her home. She was born on October 5, 1961, a daughter of the late Frank “Billy” Shumate and Earnestine Burton Shumate. She attended Parker High School and was a caretaker for many children. 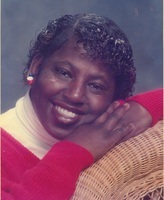 She was preceded in death by her brother, Willie D. Shumate. Surviving: one daughter, Towanna Shumate (Aarron Cohen) of the home; one sister, Shelia (James) Dennis of Greenville, SC; one brother, Franklin Ballenger of Greenville, SC; one aunt, Amelia A. Burton of Greenville, SC; three uncles, Albert L.(Iona) Burton of Orangeburg, SC, Michael Burton and Freddie Burton, both of Greenville, SC; a special friend, Johnny Black; and a host of nieces, nephews, other relatives and friends. May GOD bless and keep you during this time. Praying for the Family. Wow! I was so sadden to hear of Sandra's passing. Wanda and Shelia you have my deepest sympathy during this difficult time. May God bless you both! I'm so very sorry for your loss...Yahuah will grant each of you his peace...Shalom.